Germany's Finance Minister, Wolfgang Schaueble, has long been critical of ECB monetary policy. He has now demanded that the ECB raise interest rates. Are ECB interest rates too low for Germany? Representatives of German banks, pension funds and life insurers say they are too low. But in its October 2015 monthly report, the Deutsche Bundesbank cast doubt upon both the worries of financial institutions and the anger of savers. Saving in "currency and transferable deposits" has more than doubled since 2001, at the expense of more risky, higher-yielding investments. German households are accepting lower returns on savings in return for lower risk and greater liquidity - a clear sign of risk aversion. The real return on a balanced portfolio being about 2% suggests that interest rates in Germany are not excessively low. Savers who are getting lower returns are paying the price of their own risk aversion. Germany's Finance Minister, Wolfgang Schaueble, has long been critical of ECB monetary policy. But now, as Reuters says, the gloves are off. In a speech at a prizegiving for an ordoliberal economics foundation last Friday, Dr. Schaeuble demanded that the ECB raise interest rates. "I said to Mario Draghi... be very proud: you can attribute 50% of the results of a party that seems to be new and successful in Germany to the design of this [monetary] policy," Mr. Schäuble said. 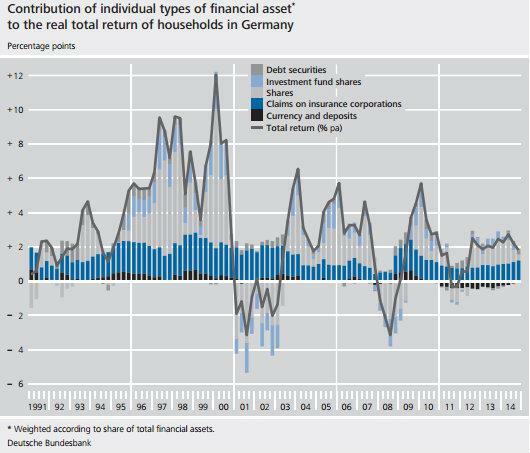 ... there is quite some evidence to suggest that real returns are not a major driver of the saving and investment behaviour of households in Germany. In actual fact, this behaviour has probably, in recent decades, been shaped chiefly by developments in (expected) disposable income, changes in the institutional framework (especially the tax and social security system), demographics, wealth levels and households' preferences and (risk) attitudes. It appears unlikely that the - clearly volatile - real return(s) should be a dominant factor influencing saving and investment behaviour given that the latter has displayed constant patterns over time and been subject to only gradual changes. So, German households save firstly because they are (relatively) wealthy, secondly because they are ageing and thirdly because they are worried about the future. Real returns on savings are much less significant. Financial institutions may have promised savers the moon, but failing to deliver it is not going to stop people saving. ... the return on households' financial assets - measured in real terms and taking into consideration all the major financial assets in the portfolio - is not as meagre as the low nominal interest rates on bank deposits would initially suggest. Alongside the currently low rate of inflation, this can be attributed in large part to the fact that households hold not only comparatively low-yielding bank deposits but also financial assets that generate strong returns. The total return since the outbreak of the financial and economic crisis may be down on average compared to pre-crisis levels, but since the early 1990s there have been repeated spells in which the real total portfolio return has been far lower still. As we have already seen with Japan - which is even further along the ageing-society curve - the faster a society ages, the more risk-averse its population becomes and the more it tends to save. 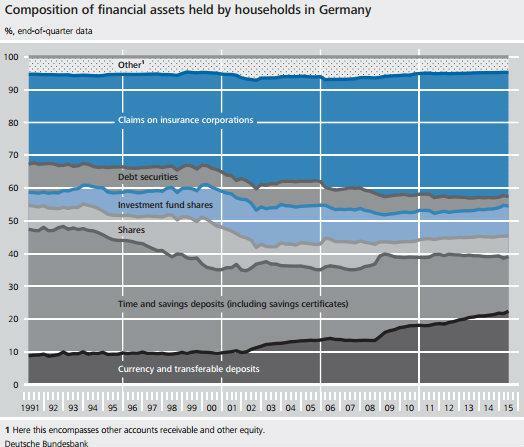 German households are unquestionably increasingly risk-averse. But they don't appear to be saving more. 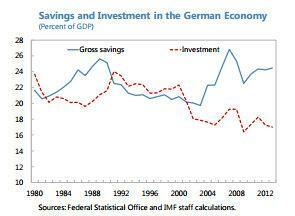 The German personal savings ratio has hovered at around 9% of GDP for a long time, and was even higher during the 1980s. This does, of course, to some extent reflect rising income among German middle-class households. But it also suggests that Germans are largely immune to wealth effects. Even with rising income and today's very low interest rates, they are reducing their household leverage, which is economically equivalent to yet more saving. Borrowing for consumption isn't something they want to do. They want to accumulate wealth. Now, saving = investment is an identity, so this gap must be closed somehow. This is the driver of the German current account surplus, currently 8% of GDP and rising. The inverse of the current account is the capital account. Germany's capital account is running a deficit equivalent to 8% of the GDP. That means the country is investing 8% of its GDP abroad, rather than at home. We should correctly view the German current account surplus as an inevitable consequence of an excess of saving over investment by all three domestic sectors - household, corporate and government. It has little do with wonderful German industrial production and everything to do with wonderful German thrift. However, the other side of this is currency effects. Large and growing capital exports put UPWARDS pressure on the currency. Indeed, the eurozone's own capital deficit, which is itself partly due to Germany's capital deficit, is having exactly that effect: the euro remains strong despite persistent attempts by the ECB to weaken it. But Germany's capital deficit does not respond to euro strength, because the country exports its capital mainly in euros. So the ECB is fighting a battle on two fronts - externally, where it is trying to prevent the currency rising in response to eurozone capital exports, and within the eurozone, where it is forced to respond to the deflationary effects of German capital exports. This is a battle it cannot win. The truth is that very low interest rates in Germany are not caused by ECB monetary policy. They are the result of a structural excess of saving over investment by German private AND public sectors. The prized "schwarze null" entrenches zero or negative interest rates. So, if Schauble wants interest rates to rise, he should look to his own fiscal policy, not to the ECB. To correct its capital account deficit, Germany needs to run a sizeable fiscal deficit, devoted principally to domestic investment, but also to supporting the elderly (to improve household confidence and, thus, discourage excess saving). So what if this means breaking the Stability and Growth Pact. If Schauble can renounce the Lisbon Treaty over central bank independence, he can renounce the Maastricht Treaty over fiscal debt and deficits too. Bring it on.